Ever wondered why next door’s window is looking directly into your living space? Why the neighbours home casts your deck in shadow for most of the day? Is your house supported by an impressively high retaining wall? Did you find that the driveway ended up paving over much of the precious green space around your house? If you find yourself relating to the above, more than likely, your section was subdivided long before your home was designed. 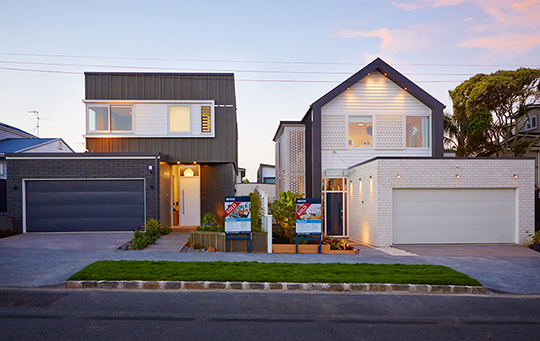 Auckland has a long tradition of a two-step approach to subdivision and building design. This means, the land parcels are usually divvied up well before any subsequent designs are developed. Unfortunately, this strategy rarely delivers effective results. The key to getting the best value from your site and your home, is to plan your home design at the same time as you subdivide. This will become increasingly pertinent in Auckland, as section sizes shrink, and we start to intensify. 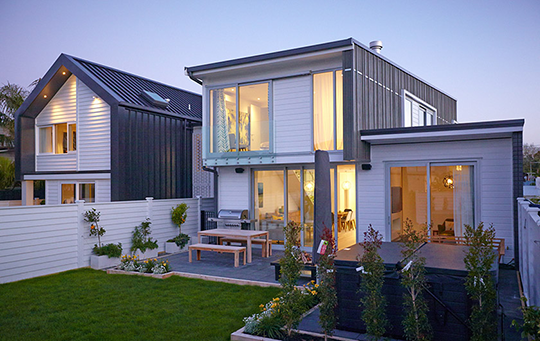 Newell Street in Pt Chevalier, as featured on The Block TV series, is an example of a successfully integrated approach to subdivision and home design. 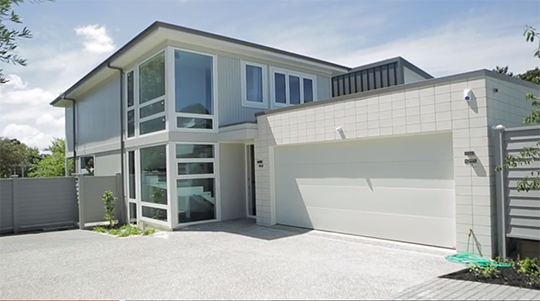 In the following video, Context Architects describe how they achieved a more successful result by subdividing two standard sections into four, while concurrently planning the houses’ designs. Interesting but what about ‘active frontage’. A considerable amount of the ground floor is given over to garage doors with associated concrete drive. I thought Councils recommended position was no more that 35% of a facade should be garage? “garage doors must not project forward of the front façade of a dwelling” in the single and ‘mixed-housing suburban” zones. The advice in the ADM around parking supports this- best practice is to avoid putting garages in front of your house. The block houses have been used on the blog to highlight the advantages of designing the house at the same time as the subdivision. For examples of housing that deals well with ‘the street to the front door’ click here. Can someone tell me why new SHA’s have streets that now have a width of 6 meters gutter to gutter. People that live in these streets and have no parking bays will soon clog the streets. Plus it is a danger as emergency vehicles cannot get through. One car parked on one side of the road then very difficult for any other vehicle to pass let alone if there happened to be two vehicles. First area problem was Mill water now Riverhead and Hauapai. When people have guests how are these issues to be remedied? This is a subdivision issue especially when no public transport available and none planned for the foreseeable future? Thanks for your question Patrick. It’s one of the big challenges for Auckland’s new neighbourhoods, how do we prioritise and balance all of the competing demands for space in our new neighbourhoods? Visitor parking is of course an issue, but only one of many issues that our engineers, planners and designers are having to address together currently. Housing affordability, stormwater management and the resilience and affordability of our infrastructure to manage and maintain going forward are all critical issues that inform the move towards 6m road widths. Visitor parking is already problematic but doesnt appear to impact on house prices in our most expensive suburbs such as Ponsonby, Grey Lynn and the city fringe. Indeed it is argued that residents accept the inconvenience for the uplift in amenity provided in living within such walkable, well connected neighbourhoods. The challenge is to ensure our new neighbourhoods provide equally connected environments, at a density sufficient to support viable public transport options. All of the public roads in the SHA’s are of course required to comply with appropriate Codes of Practice / standards, and will therefore support standard emergency vehicle access. I hope this helps explain the thinking of the engineers and planners working on these new SHAs. The new SHA’s are not within the inner city and therefore do not get benefits of the added amenities etc. They are not on transport routes and with a six meter wide road (which is only double a single car drive for a shared property which by law is 3 meters wide) it only takes one car to be parked along it and then a fire truck will not get through as the combined width will be greater than the size of the road. In these new areas people will be having guests and as such the roads clogged even more in these subdivisions. Millwater (Silverdale) at least has parking bays in some streets. others like Riverhead and Huapai do not I do not know what the South Auckland SHA’s requirements are or what they look like so cannot comment. When these SHA’s come to have public transport (if ever) then the streets may have to be reconfigured and as such a major dispute will residents. This issue could have been mitigated from the design stage and designed in larger streets!!!!! Amenities and work are not within walking distance of these housing areas and as such the neighbourhoods are not well connected. Thanks Patrick for the further detail, it highlights the complexity of the problems we face, and the devil as always is in the detail! ADM blog comments are made on the basis of a best practice approach rather than the details on any particular project or SHA. The guidance for sub-division currently sets out the principles around developing a legible road hierarchy, and the 6m typology would be towards the smaller-scaled street type within such a hierarchy, and thus not used within planned public transport corridors. The Auckland Design manual promotes a walkable neighbourhood model for all locations within the city, in order to ensure all of our residents can benefit from affordable, viable, resilient and sustainable lifestyles, which we can afford to service and maintain as Council into the future. All of the guidance in the subdivision section is written on the basis of delivering a level of amenity aligned with the ambition of becoming the world’s most liveable city, which relates to provision of parks, core council services etc, but interestingly does not include levels of parking. This is a great question and one worthy of further public discussion on whether it should? The design approach for the 6m road makes an assumption that the public will park in the same way that they do anywhere else in the city, respectfully considering the needs of other users and the road laws, and acknowledging that should they not do so, they leave themselves open to policing of infringements. The question you rightfully raise is whether this is a correct assumption and is the risk worthy of the benefit? There is a growing evidence base from the UK that we should incorporate more street parking in our new neighbourhoods, as residents find it quicker and more convenient to park on street than within ‘concealed’ parking zones in backlot locations See ‘Space to park’ report . This is an area that will continue to develop, and the advantage of the Design Manual is that it can evolve as best practice does, to reflect the emerging understanding and evidence base.